Just a day after Samsung's latest device matched Apple's largest iPhone 8 handset with an overall DxOMark score of 94, Google's newly launched Pixel 2 has now beaten both dual-lens devices with a score of 98, despite its rear-mounted single-camera design. Its top scores in most of our traditional photo and video categories put it ahead of our previous (tied) leaders, the Apple iPhone 8 Plus and the Samsung Galaxy Note 8, despite the Pixel 2 coming in lower in the new Zoom and Bokeh categories. The Pixel 2 is also a major step forward from the Pixel (which was our top scorer when it was released a year ago), moving from 90 to 98. The reviewers praised the Pixel 2 for excellent video performance, scene reproduction, color rendering, and fast and accurate autofocus, highlighting in particular its "amazing" ability to render detail in both the bright and dark areas of difficult scenes. The reviewers concluded that for just about any photo or video use case, the Pixel 2 recommends itself as the phone camera with the best image quality, with the exception of zoom and bokeh (including Depth and Portrait) that dual-camera smartphones such as the Apple iPhone 8 Plus and Galaxy Note 8 can provide. 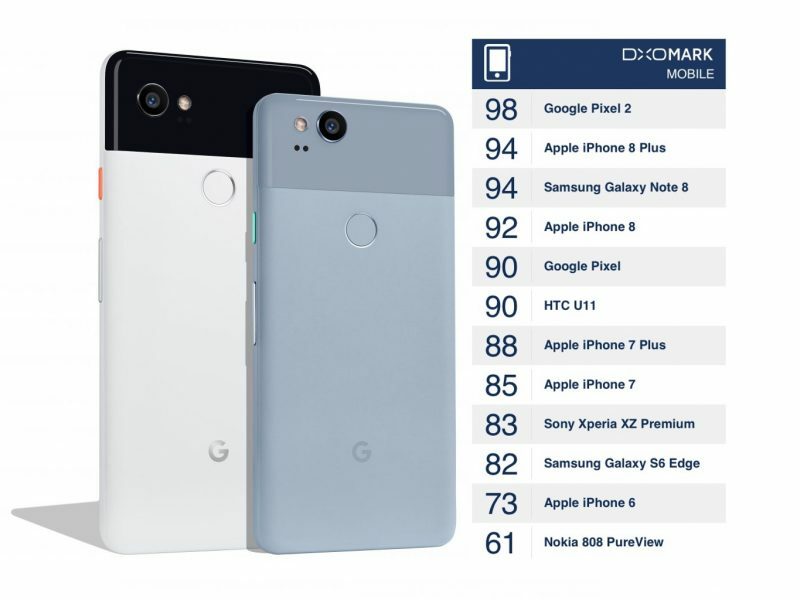 The Google handset was especially recommended for videographers, since it achieved the highest video score (96) for any device tested by DxO Labs. The reviewers signed off by noting that their scoring system has "plenty of headroom" to go beyond 100, so we'll have to wait and see if Apple's iPhone X can break that ceiling when it's released next month. You can read the full DxOMark Pixel 2 camera review and view all of the full-resolution images here. Do you agree with DxO Labs' assessment? Let us know what you think in the comments below. Honestly, all 3 phones produce amazing photos and videos. I love this competition; it forces Apple to keep innovating and breaking new grounds in the phones' photography segment. Portrait mode with a single lens looks like its much nicer and more accurate than the iPhone with its dual lens. The nuances that earn the "top spot" are irrelevant to 99.9999% of people. I for one am very happy that Google has suddenly become a full-time hardware player. We all benefit from increased competition, and there are very few companies that can compete with Apple. What Google demonstrated yesterday has a lot of potential, and the AI developments are very exciting. The original Pixel XL almost had me switch to Android. It was a close call, but I ended up returning it for 7 Plus. Unless Pixel 2 XL turns out to have issues, this might be the phone. The way Google Assistant works across the devices, and how good it is (and how fast it is getting better) is probably just as important long-term as what hardware was released. Bold move Google, welcome to prime time. Your move Apple, and no, Face ID is not it. I've cherished DXOmark but with the Samsung Galaxy Note 8 review that received the very same score as the iPhone 8, yet had nothing like the ecstatic tone as in the iPhone review, and now Google showing their DXOmark top score already in the presentation before it's been launched, I'm starting to doubt they are uncompromised from being paid. - Conclusion: "When all the tests are verified, the scores calculated, and the perceptual analyses discussed, the Samsung Galaxy Note 8 comes out as an outstanding choice for the smartphone photography enthusiast." "The Note 8 breaks new ground as the first smartphone to achieve 100 points for its photo sub-score. With new devices on the horizon from several of the key innovators for smartphone photography, will the Note 8 be able to hold onto its top spot? Time will tell." - Headline: "The best smartphone we've ever tested". - Conclusion: "Overall, the Apple iPhone 8 Plus is an excellent choice for the needs of nearly every smartphone photographer. It features outstanding image quality, zoom for those needing to get closer to their subjects, and an industry-leading Portrait mode for artistic efforts. It is at the top of our scoring charts in nearly every category — and in particular, its advanced software allows it to do an amazing job of capturing high-dynamic range scenes and images in which it can recognize faces." The Note 8 review is introducing doubts on whether it will hold its ground against forthcoming competitors, despite sharing score with the best smartphone they had ever tested, where that other review doesn't even bring up that other excellent smartphones exists and will come in the conclusion that many skip to. And now the Google Pixel 2 used already in the presentation by Google, before it is even launched. That is, Google has handed out review hardware to DXOmark even before launch, they have seen it received a top score so that it can be boasted about in the presentation. Of course, it is possible that Google was just plain lucky to happen to get a measly 4% higher score than the iPhone 8 Plus and Samsung Galaxy Note 8, and that they would have had to change the presentation in the last minute if it wouldn't have been, but given the vastly different tone in the Samsung vs Apple reviews sharing exact same score I'm not so sure anymore. The camera’s fine but in real life these top phone cameras are roughly the same. The point of the Google phone is the AI. That’s where it sets itself apart. In a vacuum Siri is inept. Compared to where Google is in mobile AI, Siri’s downright pathetic. Apple’s working hard on this and hiring good people, and they’d better; they’re way behind in this area. I hope you said the same when the 8x made number 1, there's a good chance you didn't. NEWSFLASH: Your lives aren’t that interesting people! Nobody wants to see what you are doing every second of every day. And people who are really “into” photography like so many on here claim get a dedicated camera to take pictures and hang out on photography forums. To all those who are saying Google, Apple, Samsung et al. are paying DxO for a favourable score - there's not yet been one conclusive evidence to back up these claims. It's pure speculation. Seems like there's people out there who don't like seeing other devices get praise above their own choices and instead throw cheap accusations of 'they've been bribed'. Have you heard Apple mention anything when they got top score ? Isn’t weird that Pixel is the only phone from the top spots that had been tested before it was even announced? It's not weird. In fact, it's more common than you think. Google clearly released test units to DxO for them to issue their verdict and DxO Mark score so that the score was ready to be announced and marketed at the keynote. It's more advantageous to boast about how great something is at a keynote and have evidence to support your claims than wait a few weeks until reviews start coming out when the hype starts to die down. Many manufacturers, not exclusive to tech, hand out review units pre-release under an NDA. How do you think some top reviewers got their hands on the iPhone 8 / 8 Plus and were able to show you unboxing videos before it was released? And how were a lot of them able to release the reviews immediately on release day? Apple clearly gave them some test units for reviews and permitted them to release unboxing videos before release and release their reviews on release day to create interest. It's a common marketing technique adopted across the industry to generate hype and interest.